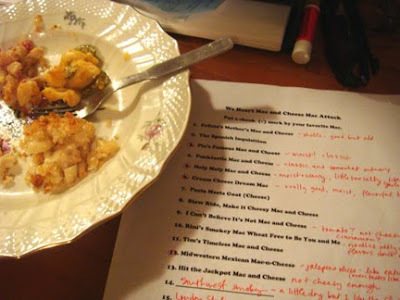 We Heart Mac and Cheese: Holy Moly Macaroni (and Cheese) - Another prize winner! Holy Moly Macaroni (and Cheese) - Another prize winner! At our recent Mac & Cheese Potluck / Cookoff, there were more than a dozen amazing dishes vying for the top prize and it was remarkable how different they all were. As our guest tasters marked their ballots, I worried that votes would be all over the map and no clear winners would emerge. But there were a handful of macs (eww!) that were universally praised, and this was one of them. Today we’re very pleased to bring you Jessica Landy Raymond’s Holy Moly Macaroni (and Cheese) which placed second, just behind hostess Hilary’s excellent cream cheese-based mac (and we swear the voting wasn’t fixed!). Although I'd already been eating macs and cheeses for an hour by this point, when I sampled a small bite of Jessica’s macaroni and cheese, my fork immediately dove back into it for another bite. It was that good! I spent the next ten minutes savoring it while trying to reverse engineer it in my mind: It was creamy in a familiar way, but it was marked by emphatic flavors that really made this one stand out in a kitchen full of macs. Garlic was the most prevalent flavor, and a welcome one, that seemed to be concentrated in the crunchy topping while the luxurious macaroni and cheese below offered a nice chile kick – the sneak-attack kind of peppers, not the light-you-on-fire kind. But it wasn’t just the decorative spiciness that captivated me; the foundation of this mac and cheese held its own with a great sauce-to-noodle ratio and a number of different cheesy notes. It was addictive and I ate every morsel of my modest tasting portion. I may even have scooped up seconds, but I'll never tell. Later, when I had a chance to chat with her, I understood why I loved Jessica’s mac and cheese so much: Her recipe is based on Martha Stewart’s classic mac and cheese, which we reviewed way back when and which is still the best darn mac I’ve ever made. When you start with something this good, it would be difficult (not to mention a sin) to really screw it up! With so many bold flavors vying for attention, wasn’t she afraid of overseasoning the dish? “People at the party loved it! They said it was spicy like me!” she grinned. Good advice, Jess. Thanks! And in case you are unfamiliar with chiles in adobo: You’ll find them in small cans next to the jarred salsas and other Hispanic ingredients in any decent supermarket, and you can freeze unused chiles and sauce in an ice cube tray so you’ll have perfect little individual heat-bombs to add to soups, stews, chili etc. A little goes a long way. Heat oven to 375 degrees. Butter a 3-quart casserole dish; set aside. Heat butter and oil in a 10-inch heavy skillet over moderate heat until foam subsides, then cook garlic and bread crumbs, stirring, until crumbs are golden. Transfer to paper towels to drain and season with salt. Set breadcrumbs aside. In a medium saucepan over medium heat, heat milk. Melt remaining 6 tablespoons butter in a high-sided skillet over medium heat. When butter bubbles, add flour. Cook, whisking, 1 minute. Remove pan from heat. Stir in salt, nutmeg, black pepper, cayenne pepper, 3 cups Cheddar, all of the Gruyere and 1/2 cup Pecorino Romano. Stir in chiles and taste to adjust seasonings/level of heat. Set cheese sauce aside. Fill a large saucepan with water; bring to a boil. Add macaroni; cook 2 to 3 minutes less than manufacturer's directions, until the outside of pasta is cooked and the inside is underdone. Transfer macaroni to a colander and drain well. Stir macaroni into the reserved cheese sauce. Pour mixture into prepared dish. Sprinkle remaining cheese and breadcrumbs over top. Bake until browned on top, about 30 minutes. Transfer dish to a wire rack to cool 5 minutes; serve hot.